Lady Skywriter: This Baby Had No Wings . . . But She Could Fly! Lady Skywriter: This Baby Had No Wings . . . But She Could Fly! I've been corresponding with two men who are presently engaged in searching out information about their respective father's early careers with Northwest Airlines. Their stories converge in the late 1940s and 1950s. Rick Seireeni's dad was a Captain for NWA and Peter Jenkins' dad was NWA Director of Operations for Tokyo and Shanghai, and retired as Vice President, Orient Region. I'd already been engaged in a very small way with Rick's search for information about his dad, Al Johnson, when Peter contacted me seeking information about his father, Reg Jenkins. When it became apparent that both fathers were in Tokyo and Shanghai about the same time, I suggested they talk. They have, with amazing results. Reg Jenkins knew Al Johnson and their families spent time together in Tokyo. In their dialog, which they shared with me, one small item that came to the surface triggered this post. Peter Jenkins recalled seeing Al Johnson driving around Tokyo in a yellow Cadillac convertible. Although he was an impressionable kid at the time, Peter claims that Al Johnson's yellow Caddy convert made a big splash with the locals, too. 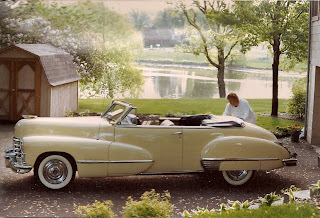 This information sent me to my garage, where I had mounted some photos on the wall of my 1947 Series 62 yellow Cadillac convertible. The photos had been on the garage wall for years, gradually fading into the "unseeingness" of things that have been in the same place for a long time. It has been fun to mentally return to the pleasure owning this terrific car gave me. I removed the photos from their plexiglass frame and promptly scanned them to save for posterity. I was not the original owner, being only 12 when it was manufactured, but bought mine later in life. After enjoying it for a few years, and a harrowing ride up I-35W during which I repeated The Lord's Prayer over and over, I decided I needed to either become an auto mechanic or marry one, and neither option appealed to me. I sold her to another enthusiast. While I owned her, I had her interior restored with the original upholstery and she won First Place in the only vintage car show I entered her in. Thanks for the memories, guys! It turns out this was not the model Al Johnson drove, but close. 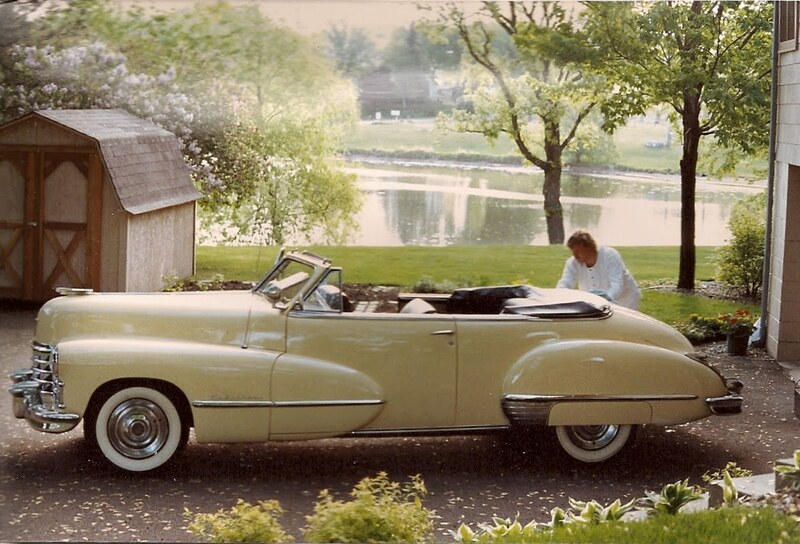 His was a 1950 Series 62 yellow Cadillac convertible. Oh how I remember you telling me when you bought the "baby" that you could have put the money into mutual funds, but then you'd only have a certificate or something. This investment, on the other hand, would take you places you really wanted to go. "You go girl" must have been coined just for you! Northwest Airlines Makes Top Ten List! Airplane! Actor Leslie Nielsen Made Us All Laugh!